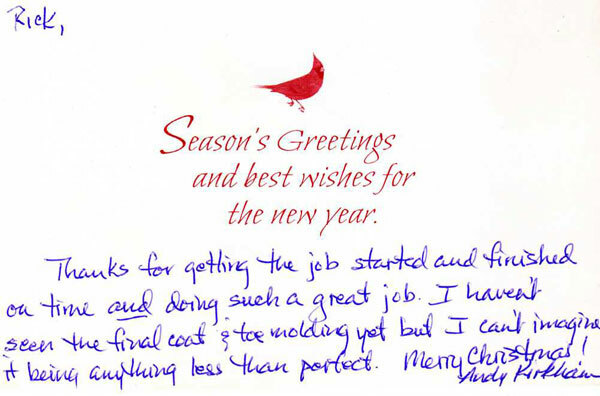 We take pride in our work and are very thankful for customer feedback. 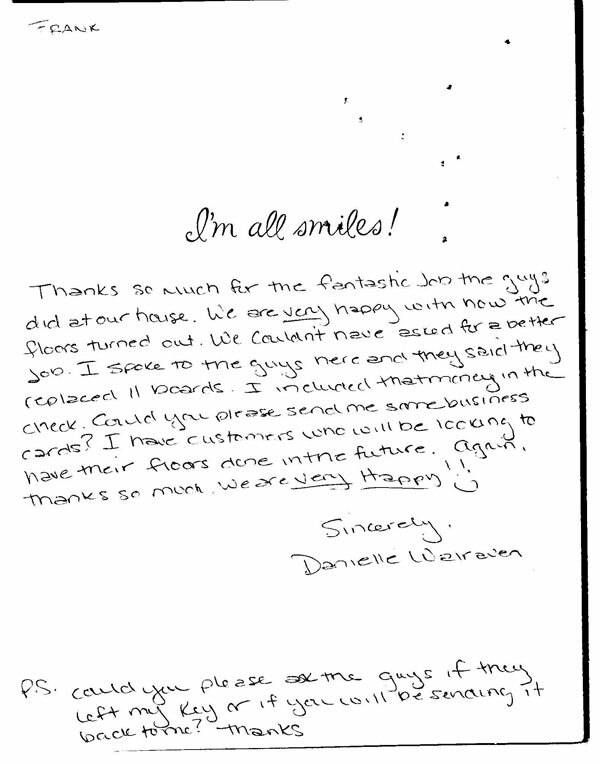 Please see some of our customer's thank you letters. Just wanted to commend your workers, Luke and his helper. We were most pleased. I was especially surprised at how much knowledge he possed regarding his trade t such a young age. Not to mention he was extremely polite. 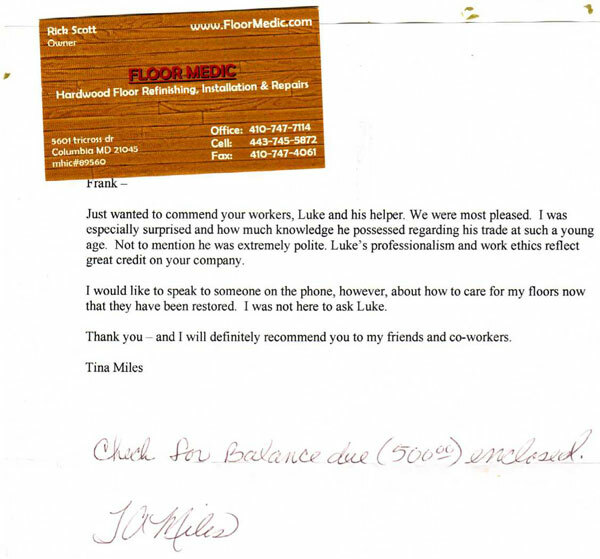 Luke’s professionalism and work ethics reflect great credit on your company. I would like to speak to someone on the phone, however, about how to care for my floors now that they have been restored. I was not here to ask Luke. Thank you - and I will definitely recommend you to my friends and co-workers. 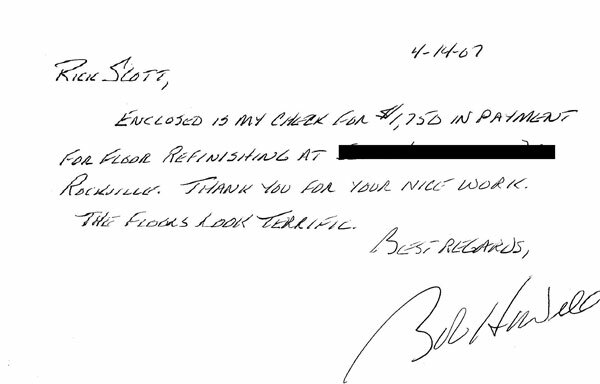 Enclosed is my check for $1,750 in payment for floor refinishing at xxxxxxxxxxxx Rockville. 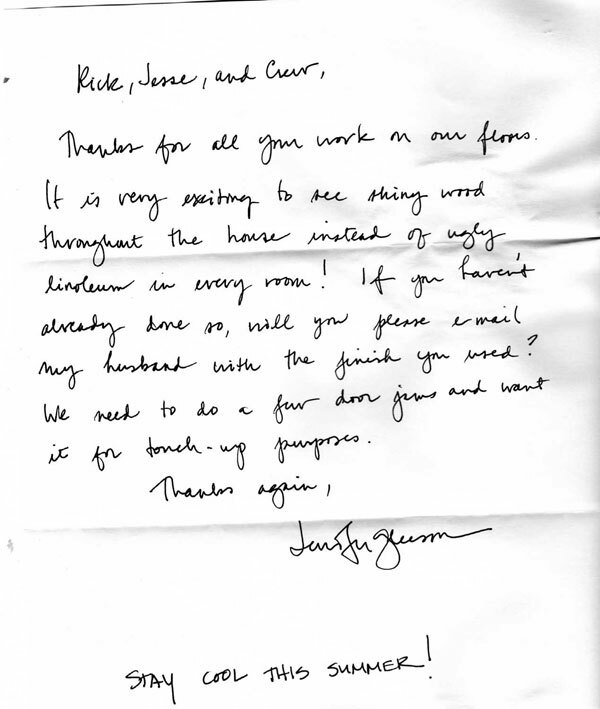 Thank you for your nice work. The floors look terrific. One change. Do not lock up when you leave. I don't have a spare key. Just leave the keys on the mantle and pull the door closed behind you. Please turn the thermostat down to 68. Thanks for all of your hard work. Here's the check and an extra $40 for each of you. Again terrific work! 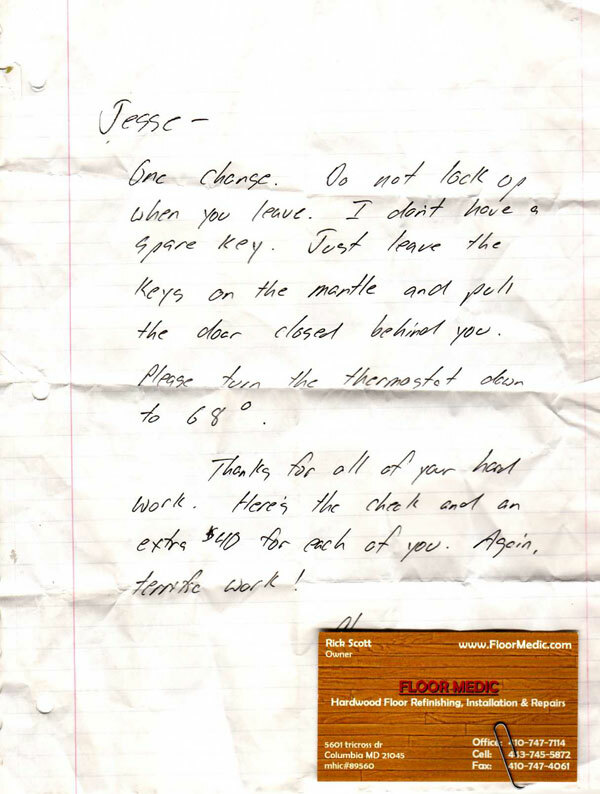 Thanks for all your work on our floors. it is very exciting to see shiny wood throughout the house instead of ugly linoleum in every room! If you haven’t already done so, will you please email my husband with the finish you used? We need to do a few door jams and want it for touch-up purposes. Thank you so much again for all you did to give me beautiful floors! You have been such a great contractor, and I will refer you whenever I get the chance! Thank you so much for the beautiful job on our hardwood floors in our new home. 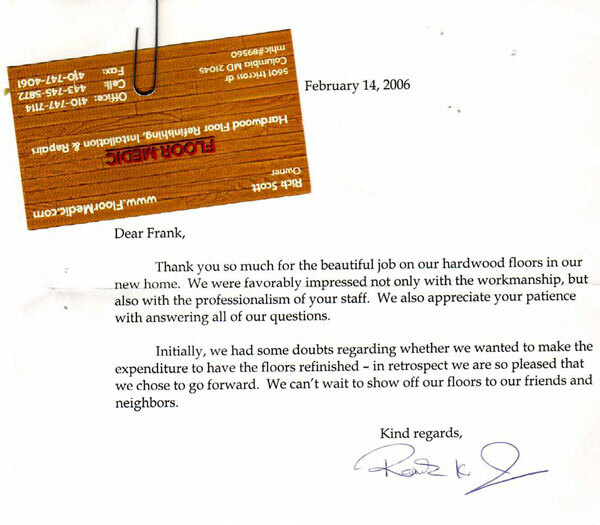 We were favorably impressed not only with the workmanship, but also with the professionalism of your staff. We also appreciate your patience with answering all of our questions. 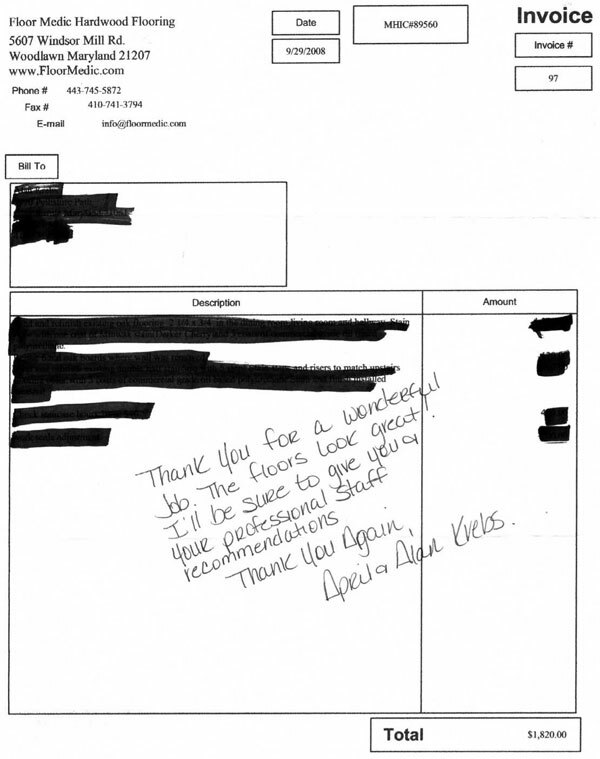 Initially, we had some doubt regarding whether we wanted to make the expenditure to have the floors refinished – in retrospect we are so pleased that we chose to go forward. We can’t wait to show off our floors to our friends and neighbors. Thanks for getting the job started and finished on time and doing such a great job. I haven’t seen the final coat & toe molding yet but I can’t imagine it being anything less than perfect. Thanks so much for the fantastic job the guys did at our house. We are very happy with how the floors turned out. We couldn’t have asked for a better job. I spoke to the guys here and they said they replaced 11 boards. I included that money in the check. Could you please send me some business cards? 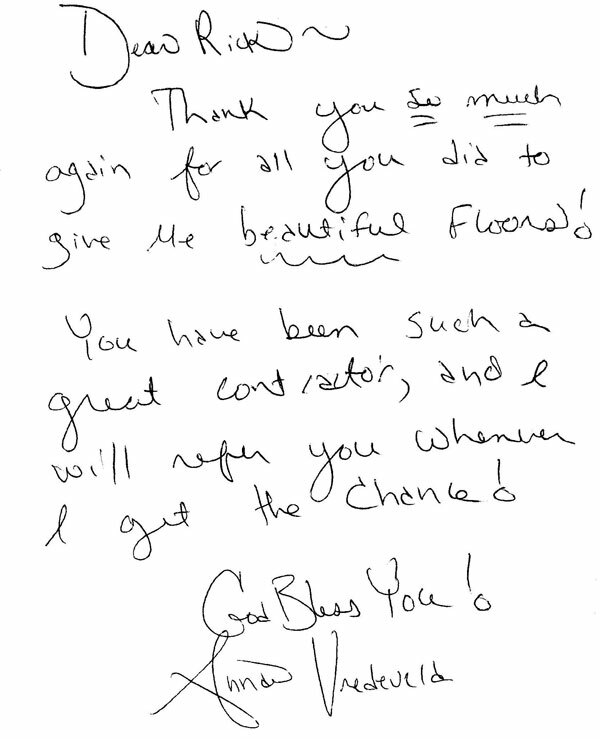 I have customers who will be looking to have their floors done in the future. Again thanks so much. We are Very Happy!! Thank You April & Alan!